On March 17th, there is a Hinamatsuri event happening at Ogura-tei (Former Ogura Residence). You will be able to make Japanese picture-story cards called “kamishibai” and small Japanese art objects using “Mizuhiki” paper cords. 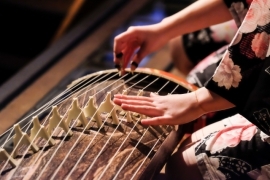 You can also experience playing the “koto” (Japanese harp) instrument.